:: We Are What We Think :: The forum ended early and I speeded… - Dreams are what you wake up from. The forum ended early and I speeded home. A friend smsed me: "A lot of mixed feelings now. I replied: "It is an organisation. it doesn't imply that I'm unprofessional and that I am unable to self-motivate. I have the confidence to deem myself as the better of the lot. In every organisation I see I notice jaded people, people who resign themselves to the supposed fate that they're in. Mired in despair, they're just contented with a 9-5 routine and will not do more. It's scary that we're supposed to be at the prime of our lives yet feel this way. And everything goes downhilll henceforth. I decided to go for a run. ECP. Yups. Running on tunes like PumpItUp, HollerbackGirl, MyGoodies, GodIsADJ, Bryana-remix is so so very good. my mind went back to the previous topic about me and my JC friends. For a couple of occasions I've interacting with friends of my age or somewhere near. I realised that somehow they all seemed older than me. that I willingly put myself in a subservient role in terms of age-seniority. but somewhat younger lookswise and mannerwise? It is only a matter of time that time slaps us hard in the face. to fit into an era that is long gone. Perhaps it's time to don that polo tee instead of that OP beach singlet? Or do we need to wait till someone says "Grow up!"? Then again, if we're happy, do we need to care? My mind meanders too much. What keeps the old alive? What keeps the older ones alive are memories of the glorious past. Just last night, someone mentioned that he has no time for journalling. I explained, "journalling is probably the best investment of time you can have." everything that could possibly mean something, and should mean something. Let's try to capture it and put it somewhere safe. Memories from the eighties - do you remember? Found in my stamp album that I forgot I actually had. PS: I think too much. 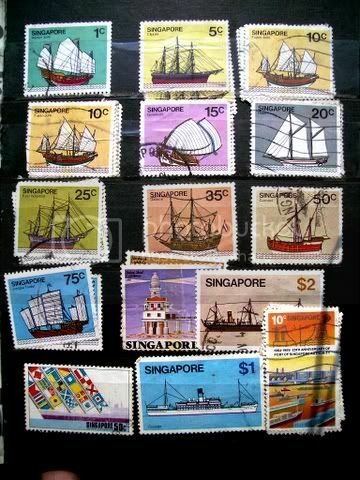 i used to collect stamps too. i have most of the stamps! dun think i have the $2 and the one on the bottom left. But i dun think that thinking too much is that bad a thing yeah? "It struck me that perhaps I am not acting my age"
btw i downloaded Eraserhead, finally! i definitely prefer thinking to running. we'll just run back to where we started from. 2ndly jogging with the music in your ear really make it seems better right??? why "think" and not think? both the old and young can still laugh, learn, regret, be wrong, love, die, cry. perhaps it's not age you're troubled about... but a sense of belonging in the scheme of things? we are what we think. point taken. may i interject a converse angel: we are also what we don't think. Or do we need to wait till someone says "Grow up!"?" each of us have our own pace in life. just like you jogging. you can't possibly have missed that symbolism yourself. we fall in love at different "speeds". eat. walk. think of every verb, and for every verb, each of us will do them all at different velocities. if one cannot hurry love, what of enlightenment? peace of mind? delieverance? transcendance? material success? there is no gear shift in life, really. everything is as it's meant to be, no matter how we struggle or disagree. it's a point of view only, yes, but it is more positive and healing. i think i used the word "too" too generally. i think i think too much, but think that it is ok to think that i think too much la la la. I agree with runecircle, thinking too much is ok. Your thoughts let you understand yourself better. In fact, nobody else can say that you think too much, except yourself. "From another angle, the rest could be thinking too little." on a more serious note, I completely agree about what you said about "journalling is probably the best investment of time you can have." I'm only worried about what happens when LJ or Photobucket crash-and-burns. "I'm only worried about what happens when LJ or Photobucket crash-and-burns." "maybe it is just how we shall wear our lives." well said and aptly put. Life is a journey. Some people walk too fast while other walk in circle. To me, what is more impt is that u keep walking on your own 2 feet. Standing up to life's challenges and carry on walking. I think getting married and having children makes you grow up / old really fast. you get dished this whole new set of responsibilities, mortgages, sleepless nights. something that we who are single get the better deal. and then we have time to think and ponder on other questions in life, and to have the time to exercise more and thus look younger ! but then, many of us, being so engrossed in our 'youth/singlehood', stop at this rather attractive rest stop, and fail to move on. we fail to embrace the next phase in our lives, and then time passes us by. and we wonder if we have been left in another forgotten generation. but if you're happy remaining at this stop, why vex yourself on these new experiences ? Or when you have decided to move on, embrace the next challenge. But bottomline, in many ways, i think we're more fortunate than the simple minded married folk who have chosen to mire themselves in their mundane existence... but again if that's their choice and their joy in life, who am i to judge ? LIFE it seems, is different things to different people. I've somehow subscribed to the "Life is about feeling"-school of thought. Enjoying the moment instead of lamenting about how it was wasted and all the wat not. Learn from the mistake. Be wiser from it, not miserable. Do watever that you feel is the best for you, that makes you feel good. actually i'm enjoying the moment. but you've raised a good point. for some strange reason, i must be writing rather bleak(ly) since people have a tendency to counsel me; thanks but i'm perfectly alright. in fact, the fact that i can journal it down means that i can look at it right in the eyes.